Team Van Oord is making good progress with works on a lock refurbishment scheme near Maidstone in Kent. 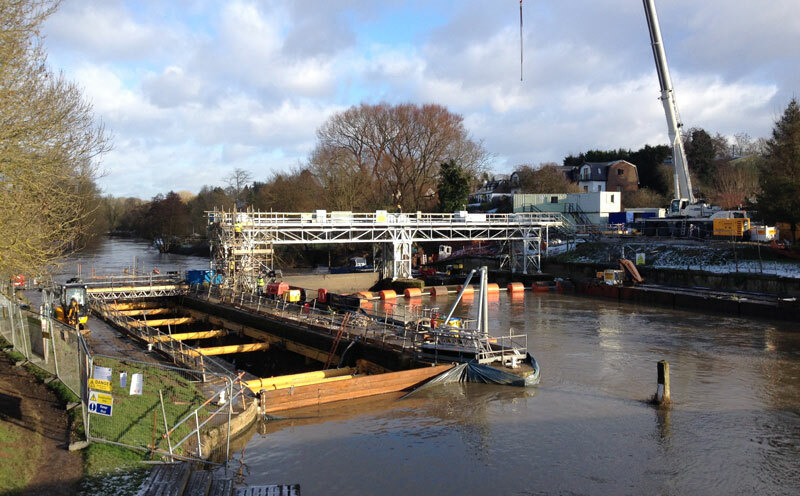 The programme of major refurbishment works at East Farleigh Lock on the River Medway is being carried out by Team Van Oord on behalf of the Environment Agency. The River Medway flows for 70 miles from West Sussex, through Tonbridge, Maidstone and the Medway Towns conurbation in Kent, before joining the River Thames estuary at Sheerness. East Farleigh village is located on the south side of the Medway about two miles upstream of Maidstone. The works are essential to ensure this important stretch of the Medway can continue to be used by commercial and private boats. The lock is now dewatered and extensive temporary works have been installed to support the existing structure, which is more than 100 years old. The next phase involves the installation of a new reinforced concrete skin within the lock itself, while at the same time the existing lock gates will be refurbished on dry land by specialist contractors. All materials have to be lifted into the lock by a 160t crane sited on the southern bank of the Medway, or transported across the river on a pontoon fitted with a hiab crane. Other works include the installation of new access stairs and ladders within the lock, and a new fish and elver pass on the southern bank. Works commenced in August 2016 and are scheduled for completion in May 2017.